Here's a second clip of U.S. Poet Laureate Kay Ryan reading in Cleveland this year. To see the first, "Is It Modest?," click here. Kay Ryan's reading occurred during the Cleveland Public Library's Writers & Readers Series at the Louis Stokes Wing auditorium on Sunday 18 April 2010 in Cleveland, Ohio — amateur video by John Burroughs, a.k.a. Jesus Crisis, posted for educational purposes only. "Miners' Canaries" comes from Kay Ryan's 2010 book The Best of It: New and Selected Poems (published by Grove Press). 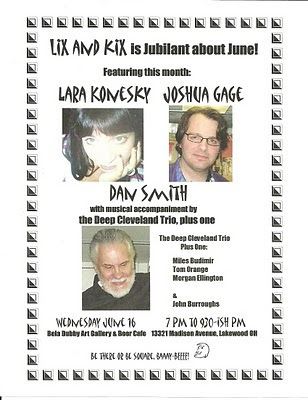 Wednesday 16 June 2010 at 7 p.m. — when Joshua Gage, Lara Konesky, and dan smith will be our featured poets at the Bela Dubby Art Gallery and Beer Cafe, 13321 Madison Avenue in Lakewood. An open mic will follow. Lara Konesky of Columbus is author of the recently published Next to Guns [Grievous Jones Press]. Joshua Gage is a contributor to Cleveland Poetics: The Blog, author of breaths [vanZeno Press], and co-author (with J.E. Stanley) of the recently published Intrinsic Night [Sam's Dot Publishing]. dan smith is the author of Crooked River [deep cleveland press] and winner of the 2009 Hessler Street Fair Poetry Anthology contest. He will be accompanied musically by Miles Budimir and Morgan Ellington of the Deep Cleveland Trio. Saturday 17 July 2010 — Dianne Borsenik and John Burroughs, a.k.a. 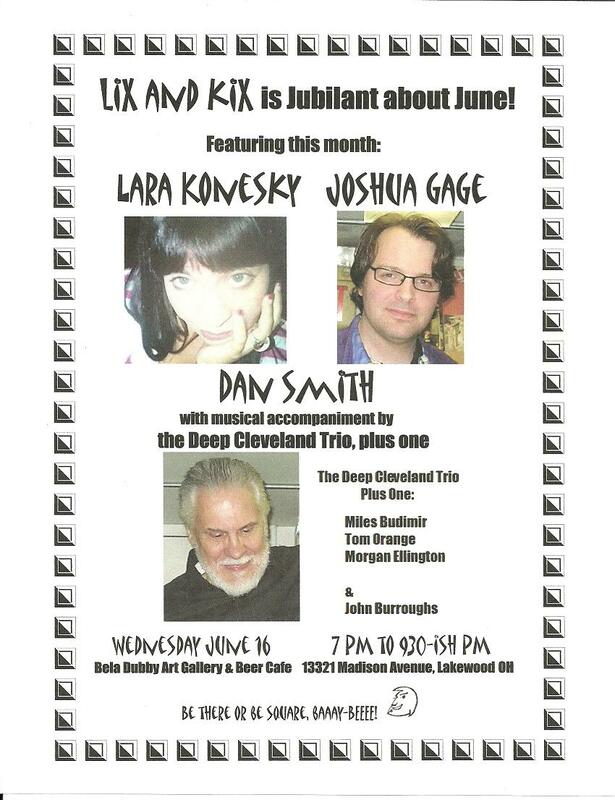 Lix and Kix, will be featured poets during the Ohio Poetry Association picnic in Marion, Ohio. Event begins at 1 p.m. and will include an open mic for OPA members. Wednesday 21 July 2010 at 7 p.m. — Our featured artists will include Alex Gildzen (originally of NE Ohio and currently of Santa Fe, NM - author of many books including Elyria by Crisis Chronicles Press) and Cleveland's own Alex Nielsen and Christine Howey during the Lix and Kix poetry extravaganza at Bela Dubby in Lakewood. An open mic will follow. Wednesday 18 August 2010 at 7 p.m. — Renée Alberts & Nikki Allen (bringing their cut and run poetry tour from Pittsburgh) and the one and only Steve Abbott (from Columbus) will be our featured poets during the Lix and Kix Poetry Extravaganza at Bela Dubby in Lakewood. An open mic will follow. 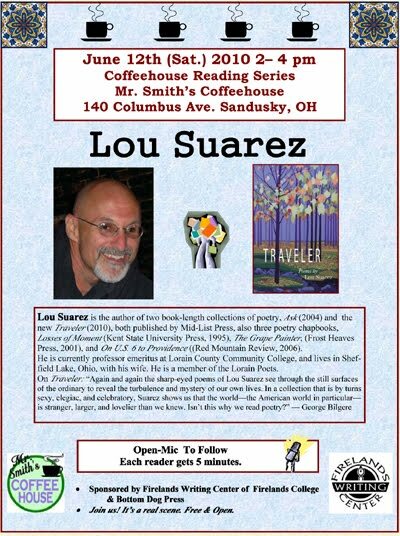 Wednesday 15 September 2010 at 7 p.m. — Our featured artists will include Lou Suarez, author of Traveler [2010, Mid-List Press], Meredith Holmes and a to-be-announced musical guest during the Lix and Kix poetry extravaganza at Bela Dubby in Lakewood. An open mic will follow. 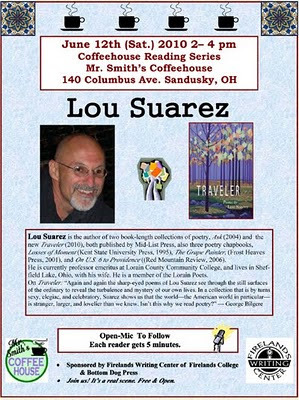 Lou Suarez will be reading from his new book Traveler at the Sandusky Coffeehouse Readings this Saturday at 2:00. Lou is a longtime supporter of writing in our region, and he always shares himself along with his poems. Join us if you can. Press, 2001), and On U.S. 6 to Providence ((Red Mountain Review, 2006). 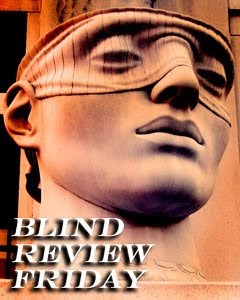 The April issue of the Cordite Poetry Review is a special issue on zombie poetry. Zombies are a peculiarly American trope, and it's odd to see Cordite ("Australian poetry and poetics") doing an American obsession. Despite their invention in Haiti (does anybody still connect zombies with vodoun any more? ), zombies were drafted into America by George Romero, who, with Night of the Living Dead, reenvisioned and redefined the idea of the walking dead so vividly that even forty-some years later, we still see them as Romero saw them. As authentically American as American flags on the fourth of July. So, back to Cordite. (Cordite, by the way, is a World-War-I era form of gunpowder used for rifles and artillery. It's called "cordite" because it's formed into cords-- it looks like strands of orange-white spaghetti. If you're writing men's adventure fiction (or poetry), could you please stop talking about "the smell of cordite"? It's mostly obsolete, hardly anybody uses it any more. Thanks you.) So, zombies have long since infected the world, even Australia. What makes us so fascinated about zombies, anyway? Does the world need zombie poetry? And, more important-- is it any good? 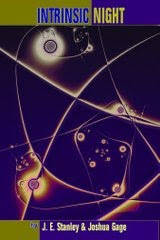 Death has fascinated poets since around when Gilgamesh was king-- Death be not proud, Because I could not stop for death, Rage, rage, Garden of Proserpine, not to mention about a million others, including just about every poem that Edgar Allen Poe ever wrote. So, what are zombies, but death on the prowl, coming for you at any moment your attention wanders? So, sure, why not zombie poetry? 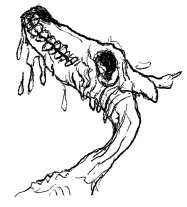 "We know more about the undead species who have lived in our hearts and dined on our minds than ever before. We have probed into their weaknesses, evaded their tricks and know well of their canny (and uncanny) chicanery. We know these things … because they were once like us. Let us not rest on our laurels. Let us be vigilant and as ready as we can be for the uneasy future that is Zombie 2.0." *See also the story "Some Zombie Contingency Plans," by Kelly Link. Check it out; Kelly Link is really weird. And I mean that in a seriously good way.